We’re an established website design & development business in Cowlitz County, Washington. Graticle is your single source for website design and development since 2009. We specialize in web design for clients looking to take their existing website to the next level. We’re based in Longview, Washington (Cowlitz County). At Graticle we will ease your mind by creating a design that’s tailored to your business and message. Then, we walk you through the options to find the format that will best accomplish the goals you’ve established for your website. We do our best keep you involved at every aspect of the project. From creating the initial layout in a wireframe, all the way to the staging server when we’re prepping the website to go live. Communication is key, and we keep you aware of our progress weekly, if not daily. Need proof? Read any one of our 72 testimonials and browse our portfolio. After years of frustration with their previous websites, Randco Tanks came to Graticle for a next-level website that best showcased their unique business online. 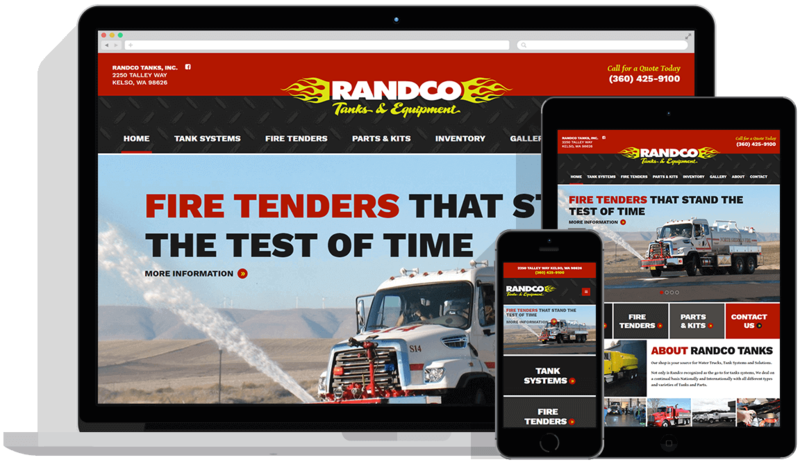 Randco Tanks came to us in need a new, fresh website that not only looked excellent but more importantly, helped expose them to more potential customers and ultimately, bring them business. We accomplished this through a variety of methods, including a responsive/mobile-friendly website, large text for ease of reading, a photo-driven layout, and large calls to action throughout the website. Tyler Salvig, Manager at Randco Tanks, Inc.
Graticle has been a wonder and rainmaker for our several divisions of marketing and Web presence. I value the fact the company delivers as professional and best of all in budget! We have used Graticle on multiple projects and they have always performed above expectations. I value their professional opinion and will always look to them for any new projects in the future.